If there’s one word to describe what the Open Art Shelter does, it would be ‘vast’. 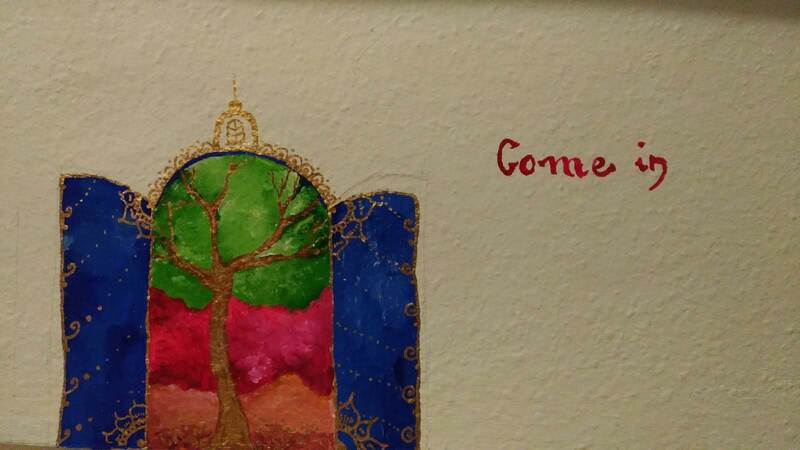 Ranging from support services, trauma therapy, painting sessions, excursions, picnics, informal language classes – the Open Art Shelter has done it all! Find a review of some of the things they’ve been up to in 2018 (as well as lots and lots of pictures!). Kids on an outing with dogs. Source: Private. A large part of the Open Art Shelter’s work revolves around introducing local culture to newly arrived children and their families. 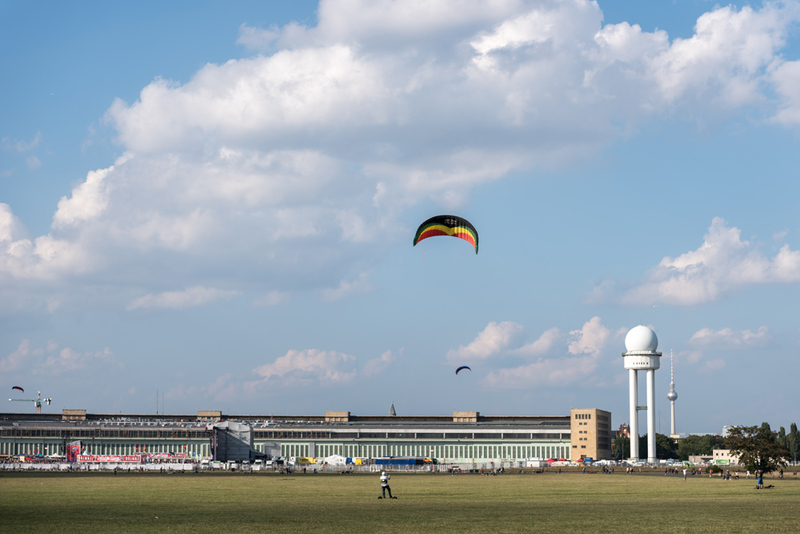 This can take various forms – from going to picnics in parks, attending a kite festival in Tempelhofer Feld, going on trips to cinemas and museums and by holding small events. Scenes from the Kite Festival. Source: Private. 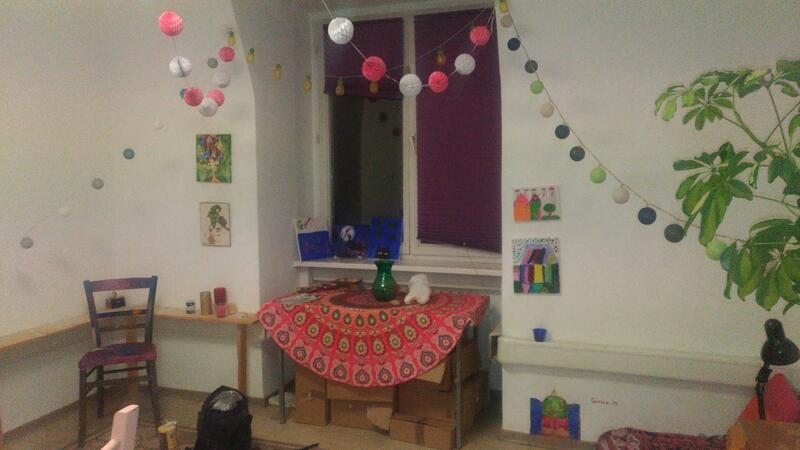 In contrast to usual integration practices, the Open Art Shelter team attempts to show newcomer families that their culture of origin is also part of local life, celebrating Muslim holidays, informing people about cultural festivities, enjoying traditional meals, or even inviting people to an Arabic movies festival. 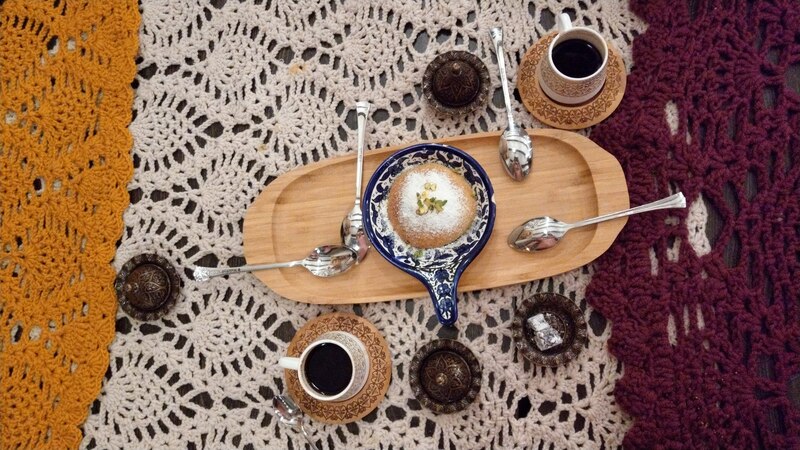 Having coffee and traditional Arabic sweets. Source: Private. 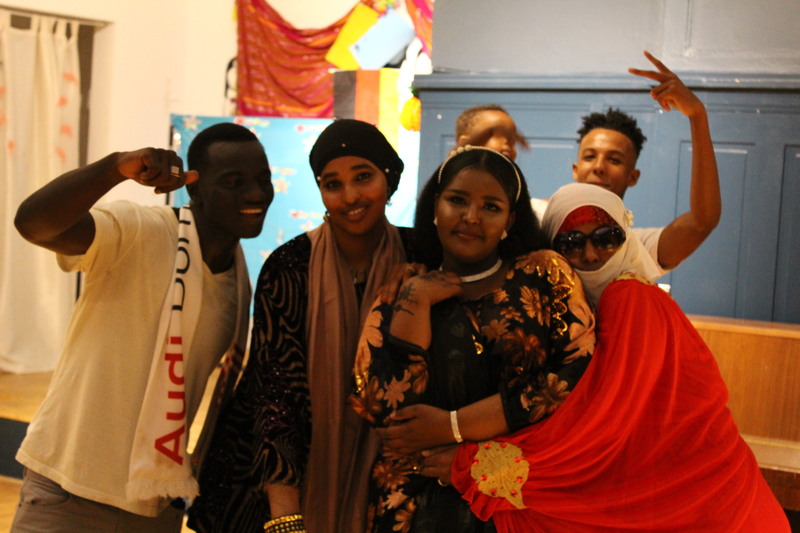 An example of this was the dance and culinary evening (“Somali Abend”) initiated and conceptualized by the Somali women residing at Sharehaus Refugio. Organized with the support of the Open Art Shelter’s volunteers, it provided an opportunity for these women to unite, network, feel a sense of community and pride. Attendees of the Somali Abend at Refugio. Source: Private. One of the kids interacting with dogs. Source: Private. 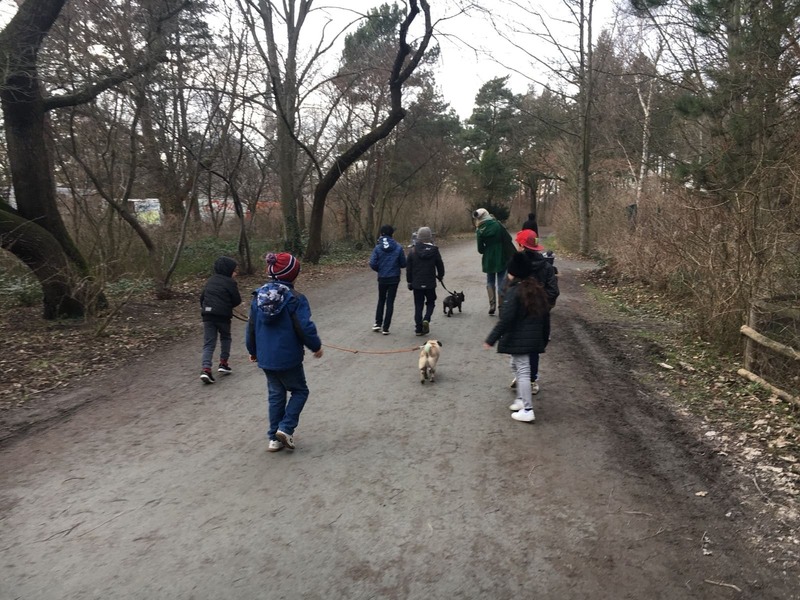 As part of its work aimed at organising outings and events to introduce newcomers to local culture, the Open Art Shelter also has a side-project known as the “Open Dog Shelter”, where volunteers come to the park with dogs. 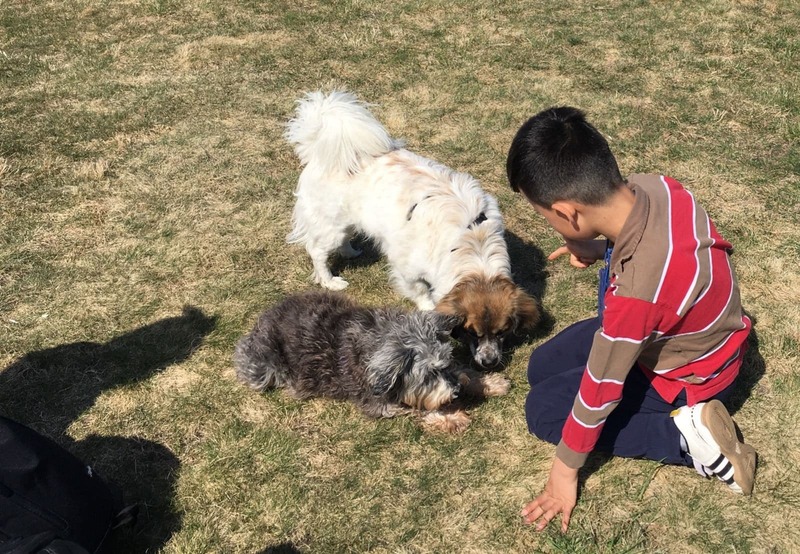 Because these children have often never had a dog, or have grown up fearing dogs, this exercise is intended to familiarise them with how dogs behave and think, understand and build empathy with animals and to help them overcome their fear of the unknown. 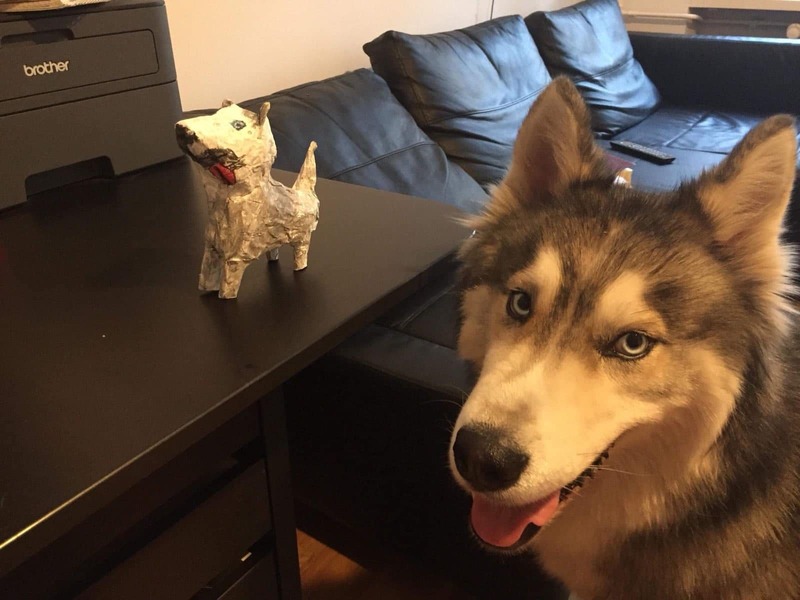 One of the dogs from the dog shelter with his papier-mâché lookalike (made by one of the kids!). Source: Private. The kids often become very attached to the dogs in the Shelter, making paintings, drawings and other crafts for the owners to keep – with some even going as far as to convince their parents to get their own dog! 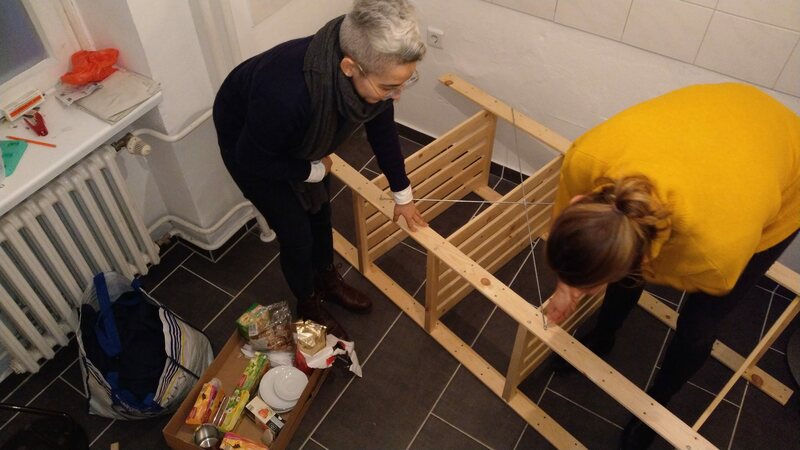 If you want to hear more funny, warm and cute anecdotes about the Open Dog Shelter, read an interview with the two volunteers who created the project. The print version of Eed Be Eed (in collaboration with Open Art Shelter). Source: Private. 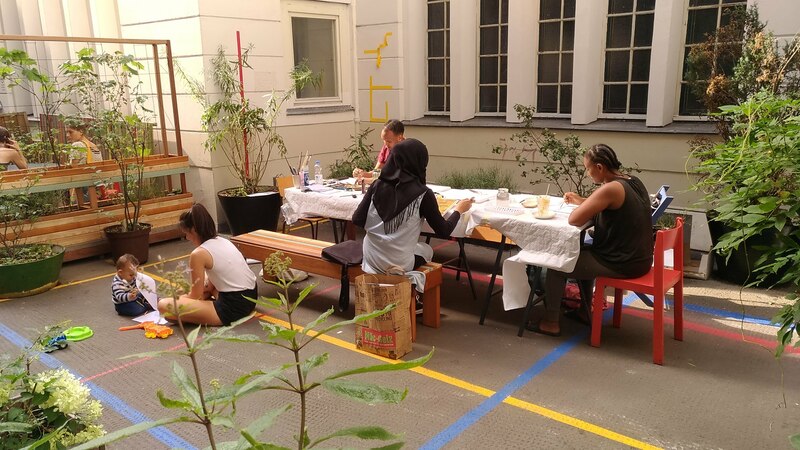 One of the largest projects the Open Art Shelter was involved in during 2018 was a collaboration with Eed Be Eed, a German-Arabic newspaper based in Berlin. This special edition issue focused particularly on the theme of mental health, including articles from the Open Art Shelter team about recognising and dealing with survivor’s guilt, music therapy in ancient Islamic societies, the loneliness of being caught between two cultures and tools for dealing with post-traumatic stress syndrome. 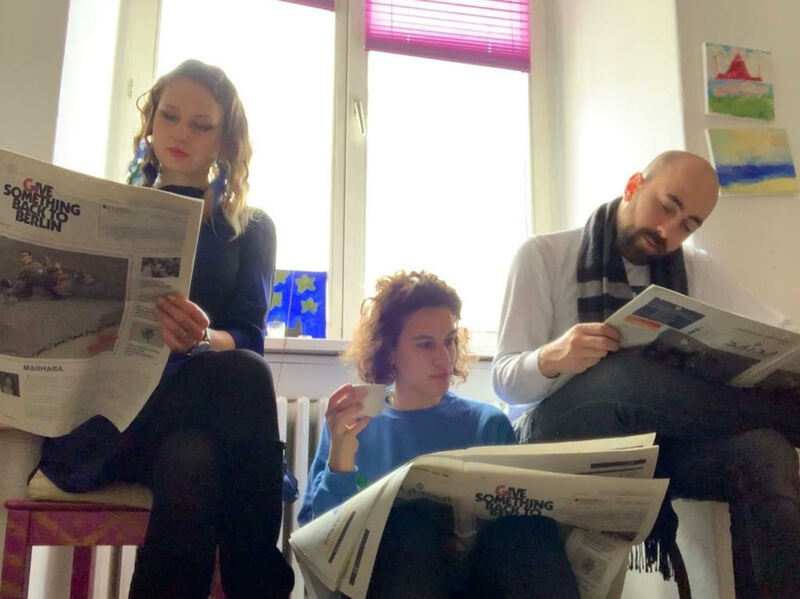 Open Art Shelter team reading the finished Eed Be Eed issue. Source: Private. A tireless team of writers, translators and proof-readers spearheaded this project, allowing the articles to be published in 3 languages (German, Arabic and English) with the aim of making these articles accessible to a wider audience. 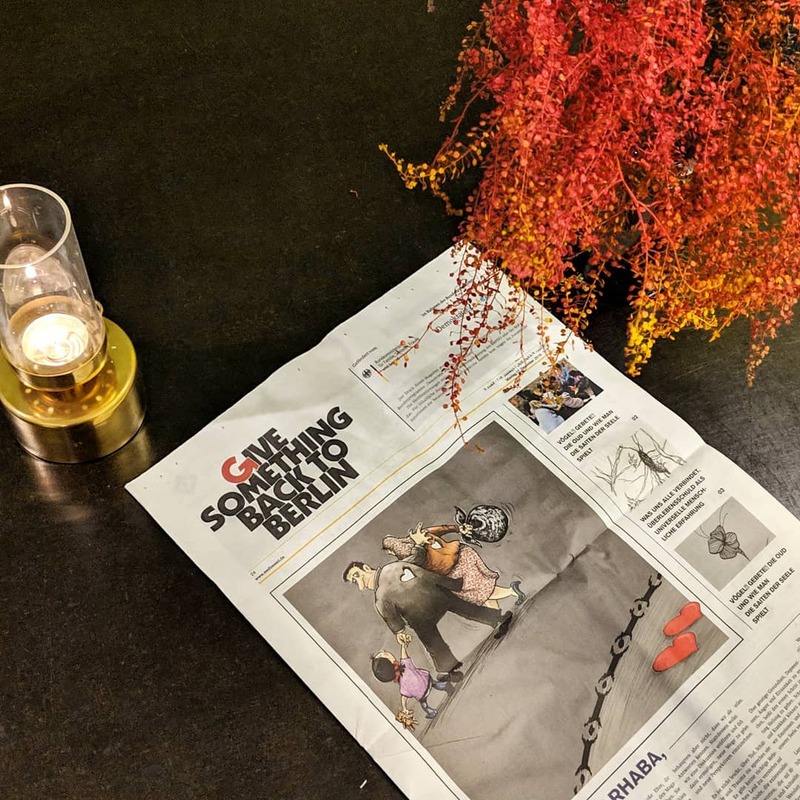 Currently, around 10,000 copies of this issue are in circulation around Berlin and Brandenburg – some of the pieces are even available online on our Magazine. Sign outside Refugio announcing Frauensprachcafe. Source: Private. 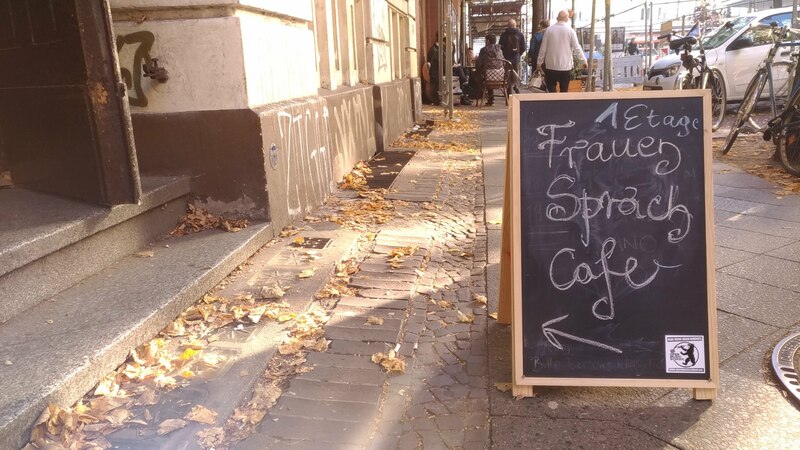 Taking place on Fridays, the Open Art Shelter’s Frauensprachcafe offers informal German classes for women that have recently arrived in Berlin. German classes are conducted only by women, and everything takes place in a safe and warm atmosphere. Wanting to align with the needs of the women themselves, the topics are always discussed with them beforehand. In the space, proper care for teenagers and children who come with their moms is provided. Attendees of the Offene Kunstraum painting outside. Source: Private. This part of the project aims at providing a safe, creative space for everyone. 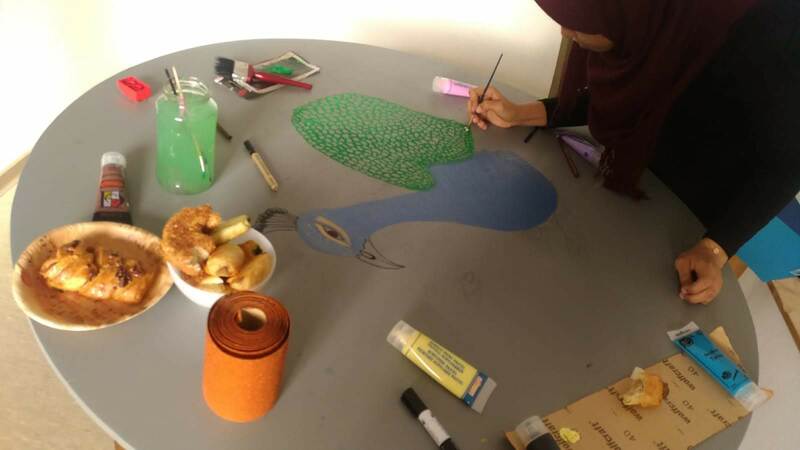 Through various artistic methods (such as painting, drawing, sculpting or crafting) people are given a chance to freely express their emotions without being judged. This space and time is about the process of inner inquiry and uncensored expression, not about perfection or technique. Sign outside the Open Art Shelter space. Source: Private. Volunteers and community members were also involved creating a common space for its purposes together. People who were involved in the process of creating the space were included in discussions on how the place should look like and how it should work. Open Art Shelters volunteers setting up the space. Source: Private. They were responsible for decorating the room according to their own ideas, thus giving the space its final shape. Attendee at the Open Art Shelter painting on the table. Source: Private. The cooperation not only functioned as a team-building exercise, but also helped in uplifting people’s creativity and passion, as well as helping them through the healing process and boosting morale. The Open Art Shelter space. Source: Private.